When most people think of Spanish cuisine, they think of tapas, and why not? These little dishes are a fantastic excuse to sample as many tastes and flavours of dishes from all over Spain as you can manage, while encouraging the shared social environment which the small dish concept inspires. Unable to decide what large dishes to cook when I was over in Spain, and with no recipe books close to hand, I decided to opt for a few simple tapas dishes which I could remember off the top of my head and which are inspired by my own tapas experiences in Andalucia and beyond. 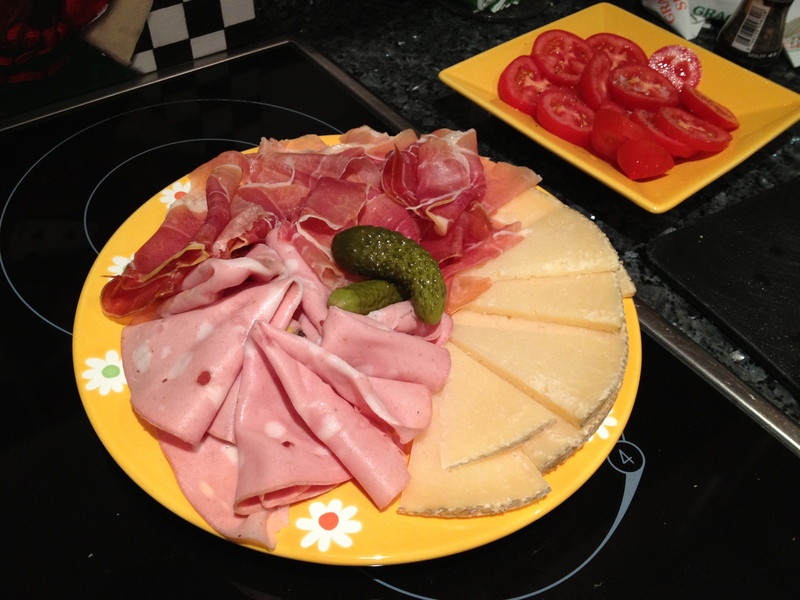 Having cooked these tapas creations, you can then supplement your tapas feast with olives, bread with delicious olive oil and different flavoured dipping salts and platters piled high with fresh serrano hams and manchego cheese (see mine at the bottom). You’ll find yourself with way too much food (unless you’re feeding a small army), but the beauty with tapas is that much of it will last for days – bonus! 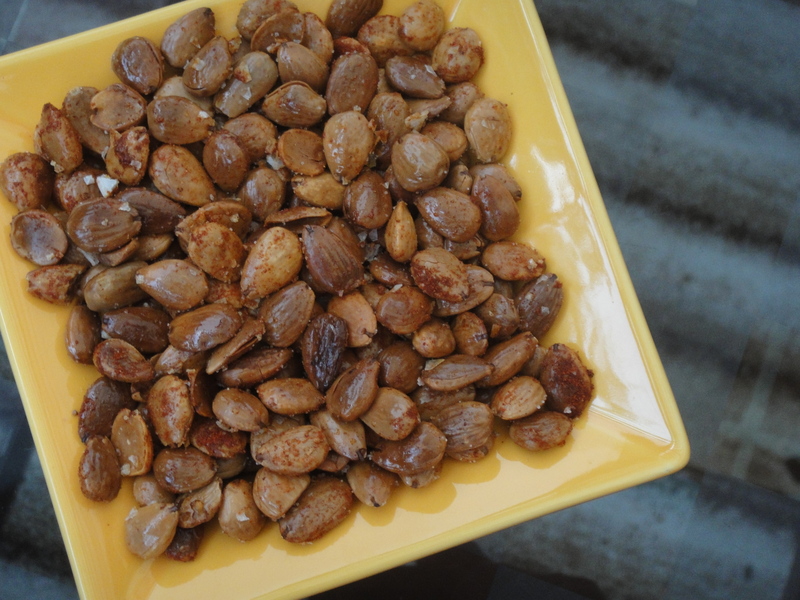 Great to kick of your evening as a moorish accompaniment to a glass of wine or two, these salted almonds are really easy to make. Take a baking tray and pour in enough olive oil to cover the base. Then throw into it (carefully – I’m not encouraging kitchen recklessness you do understand) 250g of blanched almonds, and sprinkle them with some good quality sea salt and a teaspoon of smoked pimenton. Give the whole lot a good toss, and place in the oven at 180 degrees c for around 20 minutes, tossing every so often during cooking. Be careful not to leave them in for too long – they may look ok on the outside but they can become burnt on the inside if the cooking is overdone. Russian salad is a tapas staple in traditional tapas bars all over Spain. You can alter the amounts of ingredients below depending on how many you’re cooking for. This made enough for a good 6-8 small tapas-sized helpings. 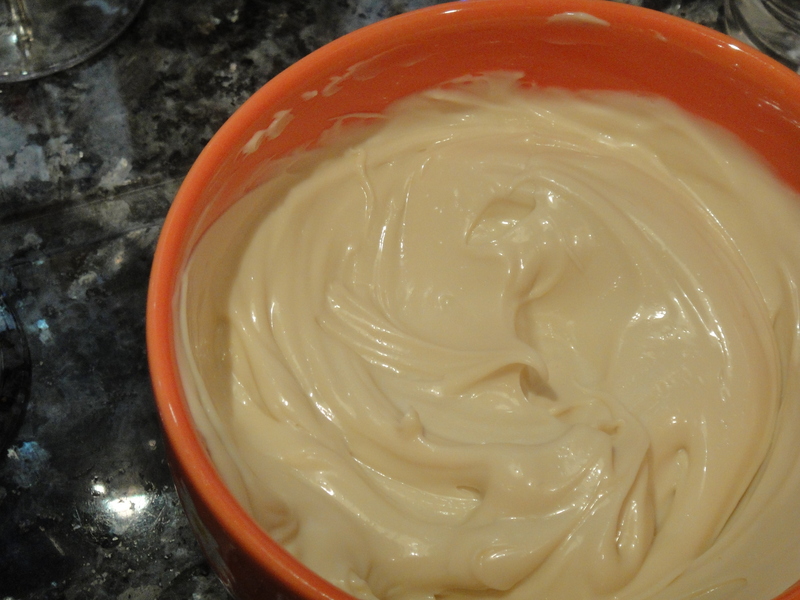 Start by making your own mayonnaise (if you can be bothered). Whisk up a large egg with a teaspoon of dijon mustard, 2 teaspoons of white wine vinegar and half a teaspoon of salt. Then to this very very gradually whisk in 300ml of oil – for those who like a mild flavour, use sunflower oil, but for a traditional Spanish flavour, extra virgin olive oil is a must. Doing this in a food processor is definitely the easiest way, but for those like me who are in a little holiday home in Spain without the best equipped of kitchens, the good old balloon whisk and a determined wrist can still do the job. Once you have made a nice thick mayonnaise, squirt in the juice of half a lemon (to taste) and 1-2 crushed cloves of garlic. Meanwhile have around 1kg of small new potatoes boiling away nicely (chop them as necessary so they’re roughly the same size). Once tender, leave to cool. 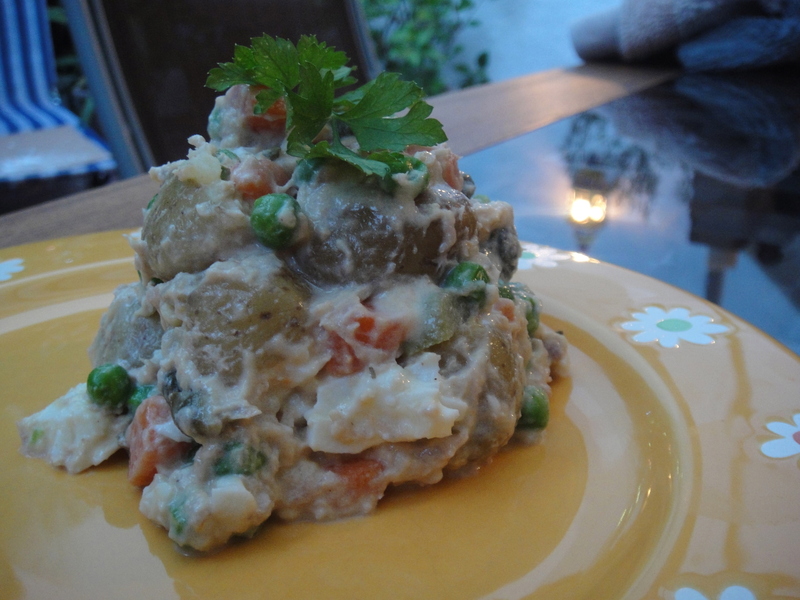 Once the potatoes have reached room temperature you need to add a good 4-6 tablespoons of mayonnaise, two tins of tuna (preferably in oil), a one or two of cooked diced carrots and a good handful garden peas, 4-6 chopped gherkins, two tablespoons of capers and some chopped parsely. Then whack in a good dose of seasoning to taste, and play around with flavour – you can add more mayo, more garlic, more lemon, different herbs – whatever you like. I guarantee it will be delicious whatever you try (within reason – obv). One of my favourite tapas dishes. Take a chorizo sausage (they normally come in a kind of loop) and chop into 3-4 large pieces in order to fit them into a small pan. Prick the surface of the sausages a few times. Fill the pan with red wine (around 2 glasses) and simmer the chorizo in the wine for 20-30 minutes. 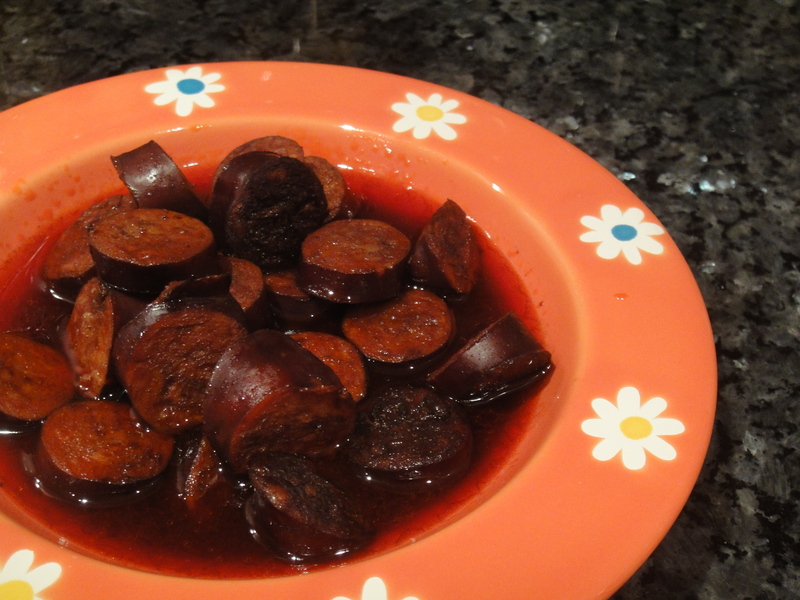 Once the chorizo has simmered away, leave it in the wine for as long as possible to soak up the flavours. 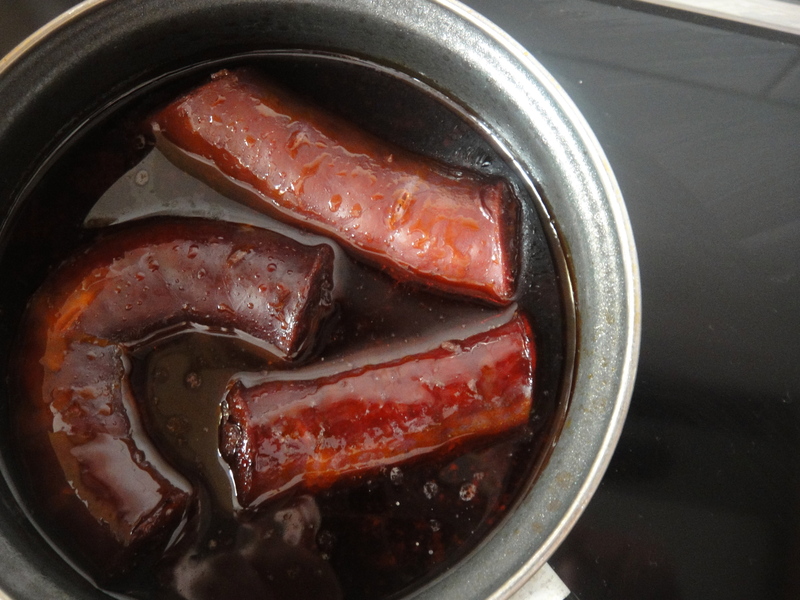 When you’re ready to make the final dish, take your sausage out of the wine (but don’t discard the wine juices). Chop into small bite sized pieces and fry on a medium head until they start releasing some fat and start smelling amazing. 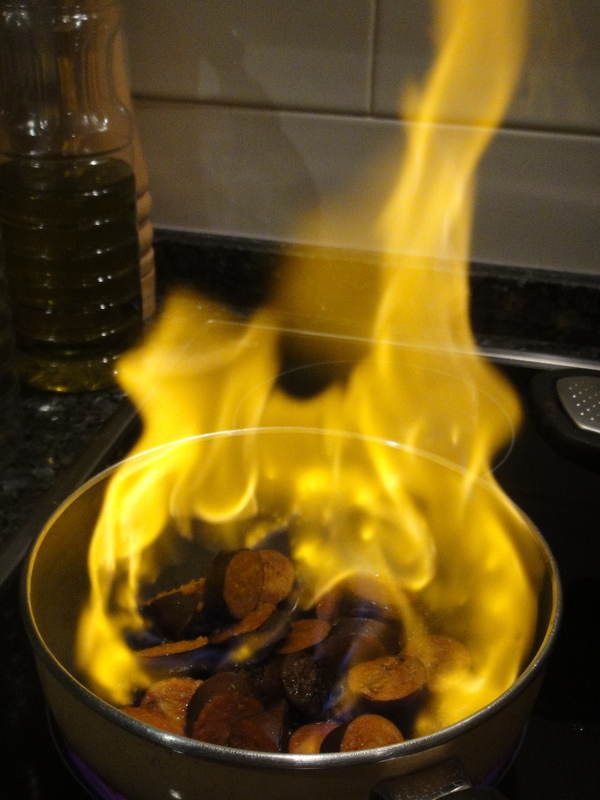 Then pour in a few tablespoons of brandy and set fire to it. Woo! (Be careful!!) Once the flames have died down, add the wine back to the dish and boil on a medium heat fairly vigorously to allow the wine to reduce slightly (by about a third). Then serve. Yum! Finally, a huge favourite of mine which I first discovered in the shady Moorish streets surrounding La Mezquita in Cordoba, these fried aubergines are a sensation of simplicity and salty-sweet harmonisation. Slice your aubergines into nice thin slices (no thicker than 5mm). Heat up around one centimetre’s depth of sunflower or vegetable oil in a large pan. 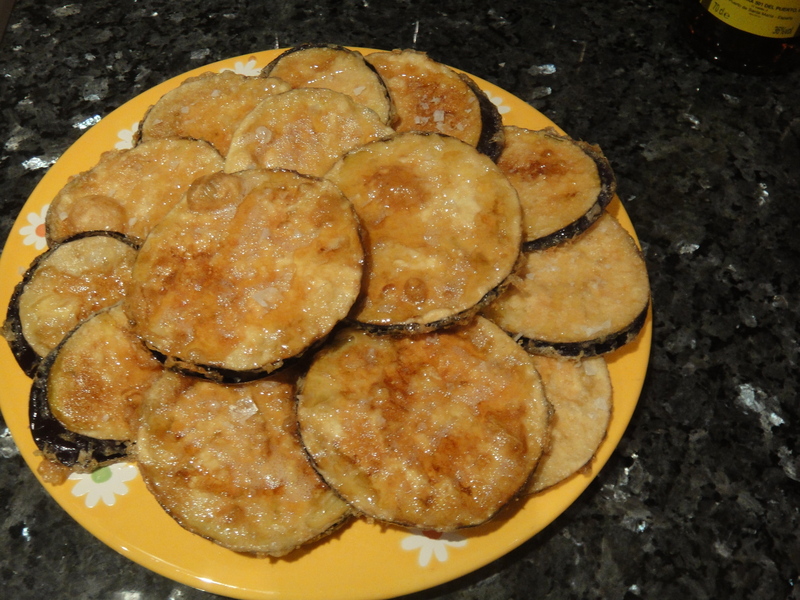 Take the aubergine slices and dust with plain flour (knocking off any residue) and then dip into a mixture of 1 egg whisked with 2 tablespoons of milk. Dip the aubergines carefully into the hot oil and shallow fry for a couple of minutes, turning halfway through and ensuring the batter becomes a nice golden brown. You’ll need to do this in 2-3 batches depending on the size of your pan – you don’t want the slices to be overlapping. Once cooked, carefully soak up some of the residue oil on the slices with kitchen paper and, if cooking in batches, keep warm. 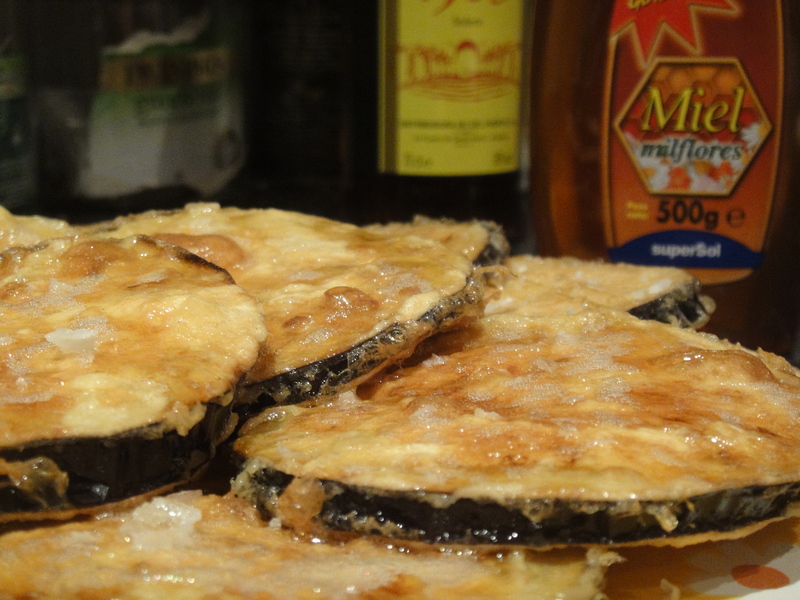 Once all your aubergines are done, sprinkle with a good quality sea salt and drizzle with a dark rich honey (or other treacles) – this is by far the best bit, and if you have a sweet tooth like me, take more honey to the table for further indulgence. So there you have it, some tapas to warm you up as the autumn takes hold. Who ever said the autumn had to be all about pumpkins? Thank you for dinner! 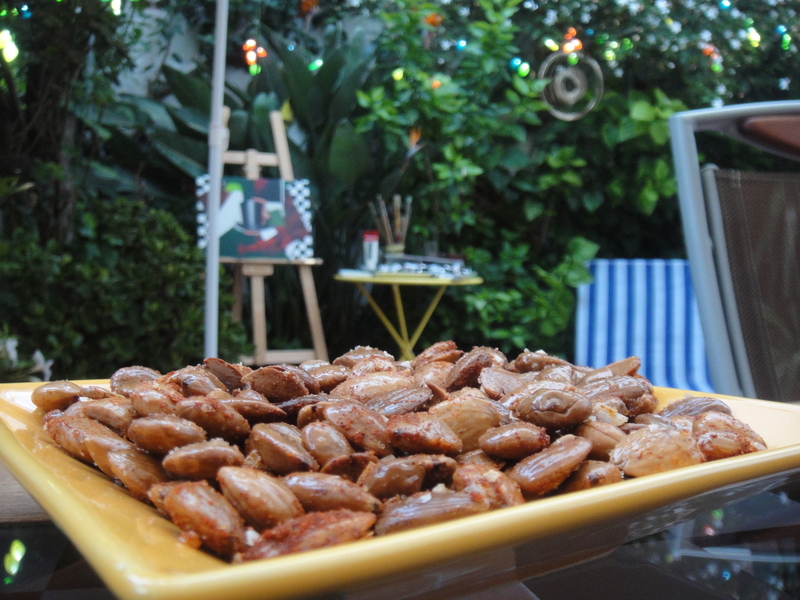 Love the painting in the background behind the salted almonds. Thanks – and well spotted! That’s the painting I started while in Spain but never had time to finish – its with me in London now. I’m desperately working on it in the evenings in between work trying to get it finished! Will upload it as soon as I have.